For those of us that have a greater love of photography than a fear of heights, there is a popular observation deck in downtown Cincinnati. Carew Tower is a 49 story, 574-foot skyscraper that was the tallest in town until 2010. For a couple of dollars, visitors can take an elevator up to about the 47th floor, then walk to anotehr elevator which goes the last part of the way where you can walk around the roof. From here, on a clear day you can see for miles. This series of 20 photos was taken in 2007 back when my camera had a 10X optical zoom. The St. Louis Church was built in 1928 to replace an earlier structure built in 1847. It not only serves as a church, but contains offices and residences for the archdiocese. From 1918 until 1980, the church held a 2:00 AM "Printers Mass" for downtown night-shift workers, particularly the printers who worked at the nearby Cincinnati Enquirer. 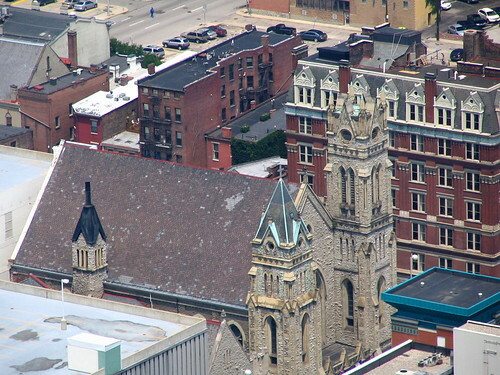 St. Xavier Church is the Jesuit parish in Downtown Cincinnati. The story of St. Xavier Parish begins in the year 1819 when the seven Catholic families in what is now the Cincinnati Metropolitan area built a church . 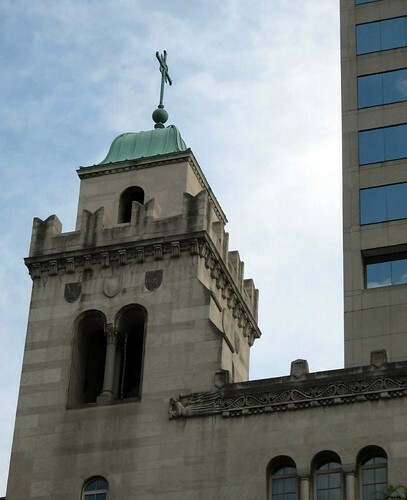 . . Their first church was a small wooden building built at the corner of Liberty and Vine Streets, where the church of St. Francis Seraph now stands. . . . At the time, Cincinnati was a part of the diocese of Bardstown, Kentucky. Two years later, in 1821, Cincinnati itself was made the seat of a diocese. Its first bishop was Edward Fenwick, a Dominican priest of the Priory of St. Rose, Kentucky. Bishop Fenwick made his home near what is now Lytle Park. Because of the difficulty of getting to the little church, now his cathedral, especially over the mud roads of winter, Bishop Fenwick purchased the Sycamore Street site and had the little cathedral put on rollers and moved . . .
Bishop Fenwick died in 1832 and was succeeded by Bishop John B. Purcell. Bishop Purcell bought additional property on Sycamore Street next to his cathedral and established a seminary and college there. Then, in 1840, he brought in the Jesuits to run the college and seminary. Meanwhile, he had begun to build a new cathedral at Eighth and Plum. When it was dedicated in 1845, the title of St. Peter-in-Chains was given to it. The church and college on Sycamore was placed under the patronage of St. Francis Xavier. 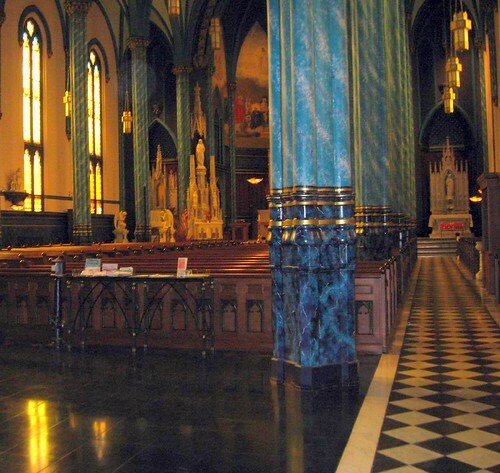 By 1856 the number of people attending St. Xavier Church was so great that a new building was planned. The building was begun in 1858 . . . In 1861, Bishop Purcell celebrated the first Mass in the great new church. . . The current church building remained basically unchanged from 1883 until the directives of Vatican II called for a rearrangement of worship space. . . . The most striking change was the redecoration of the church. It had been all beige with no color except for panels of cherry red atop the arches of the nave, and a section of cherry red carpet in the sanctuary. The architect chose bold colors that enhance the architecture and that reflect the medieval custom of enlivening great churches with strong colors.